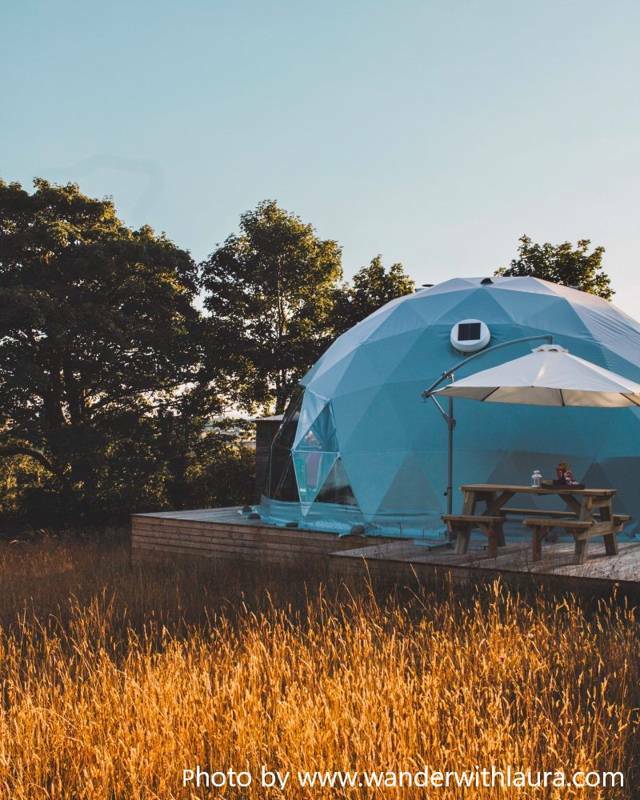 Whether its glamping on the Pembrokeshire coast or a romantic retreat in Ceredigion, there are some fantastic glamping options in West Wales. 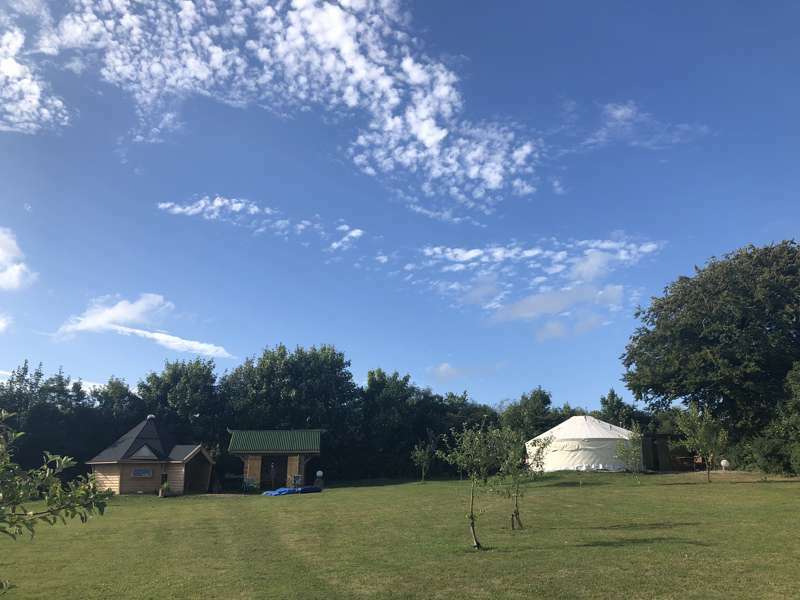 Tipis, yurts, pods, bell tents and shepherd's huts can all be found in this gorgeous corner of the country, so whatever kind of glamping holiday you're after, there's bound to be something right for you. 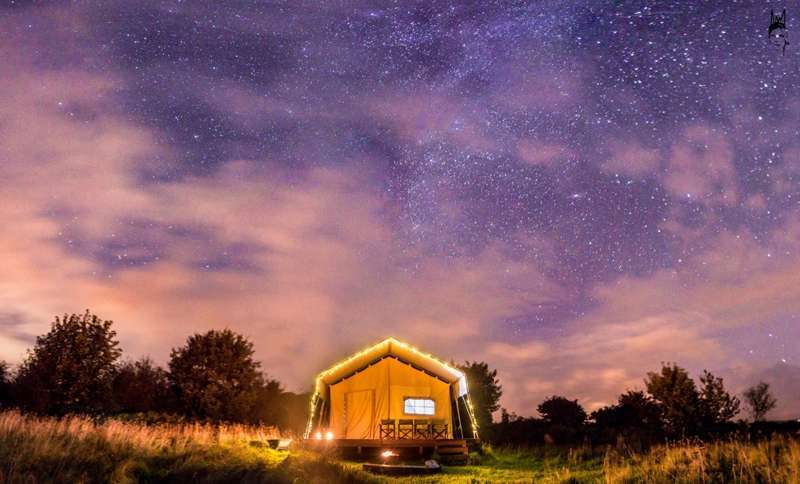 Browse our collection of the best glamping sites in West Wales below and book your next adventure online today. 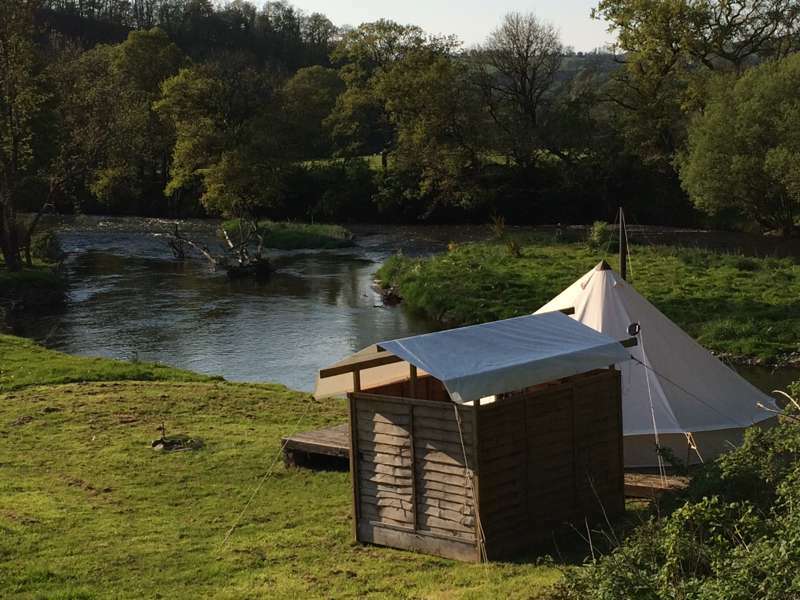 Right on the river bank, Derwen is a 5 meter Bell Tent, sleeping up to 4 with a double bed and double futon. 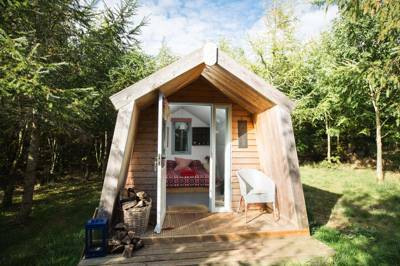 With a cosy wooburner, fire pit and private camp kitchen next door, it's the perfect place to relax. 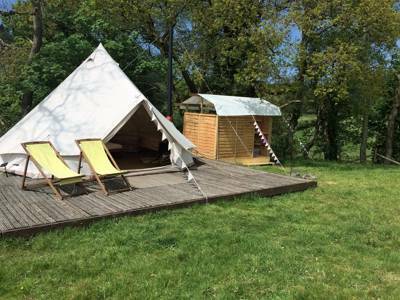 Tucked in the corner of the small meadow, close to the river, Onned sleeps 4 with a double bed and double futon. 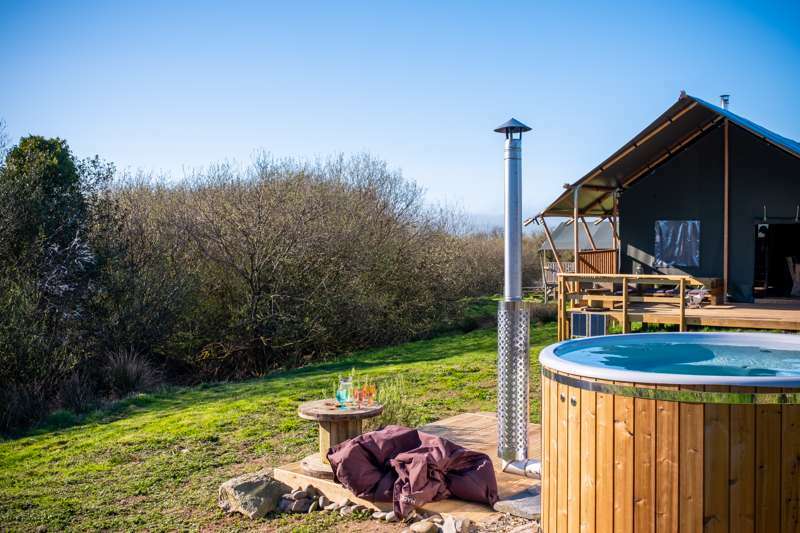 There is a woodburner to keep you cosy, a firepit and private camp kitchen close by make this the perfect spot for a quiet evening. 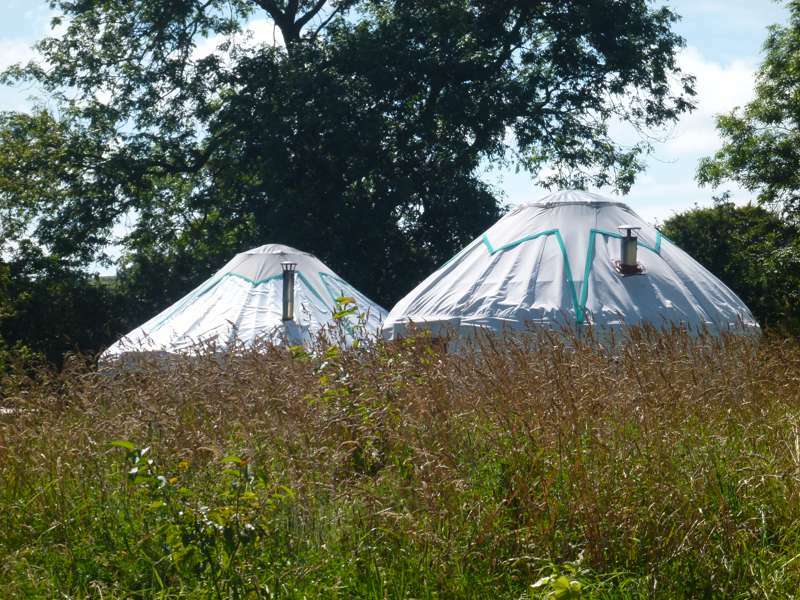 These two yurts are booked together and can comfortably fit 5 people in one yurt and two in the other. They have been individually hand crafted using the timber from our own farm. Inside you will find everything you need for your stay including a well equipped kitchen area. Listen to your wood-burner crackling as you snuggle down into your unique king-sized bed. 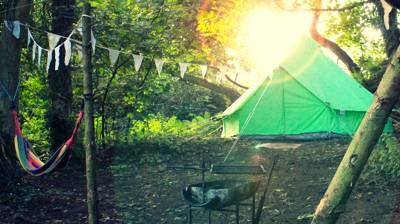 Wake up to unspoilt mountain views and breakfast around your campfire. 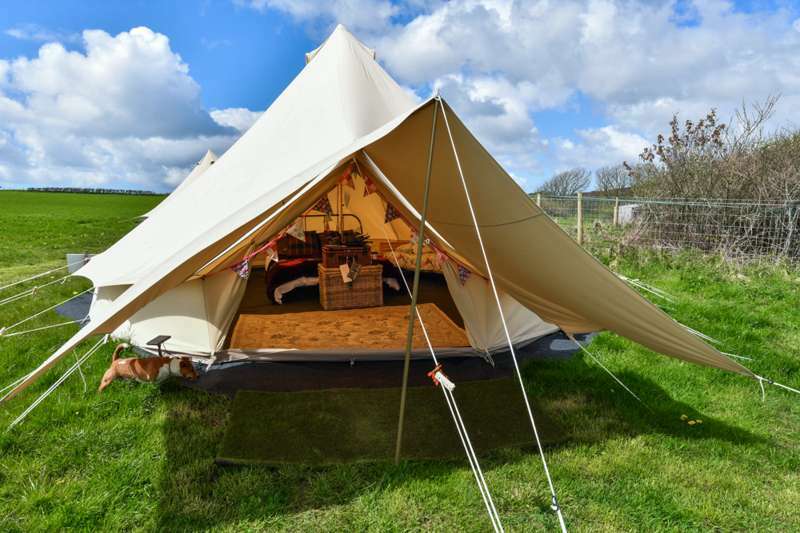 A fully-equipped five-metre bell tent with everything you need for a comfortable getaway including beds with bedding included, your own fire pit and even a use of a hot tub! 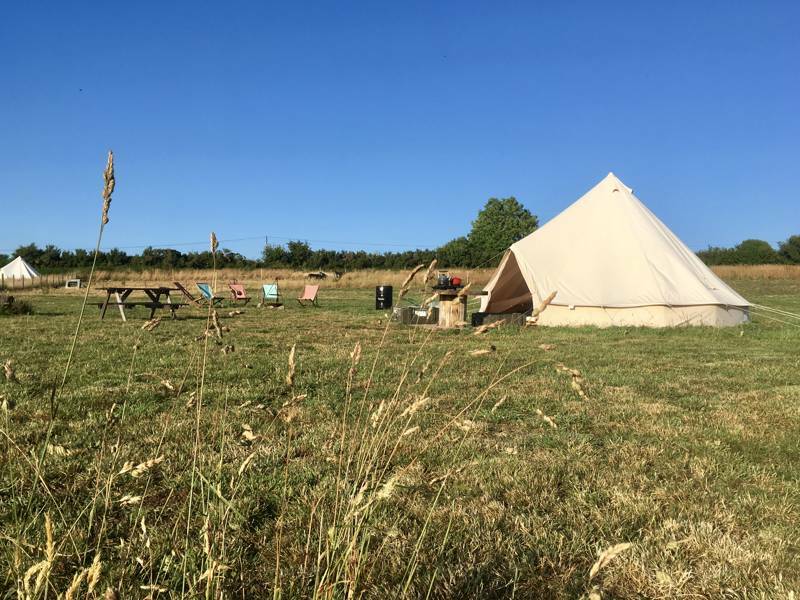 Our 4-metre Bell tent is a cosy and tastefully furnished tent, overlooking the ancient oak woodlands and angled towards the sunset. 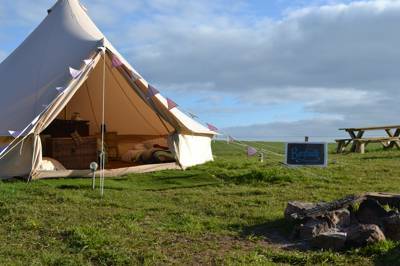 It is kitted-out with full bedding, cooking equipment, a coolbox and solar powered lamps. 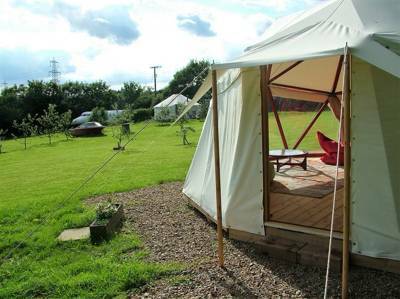 You also get a private gazebo with fire pit/BBQ, picnic table & use of the shared hot-tub (private slots available to book)!! 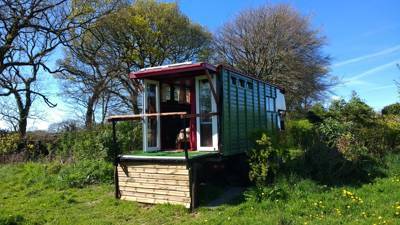 Beautifully converted old horsebox, retaining many original features. 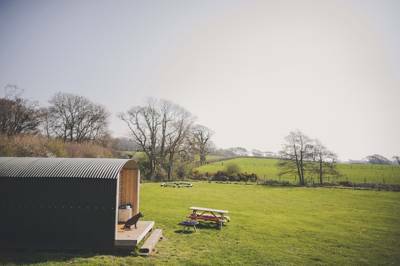 Comes fully double glazed and features wood burner and raised 'tail gate' deck overlooking the lower organic veg garden, wild meadows, grassland fields of sheep and cows with views over the Preseli hills. Bedding included. 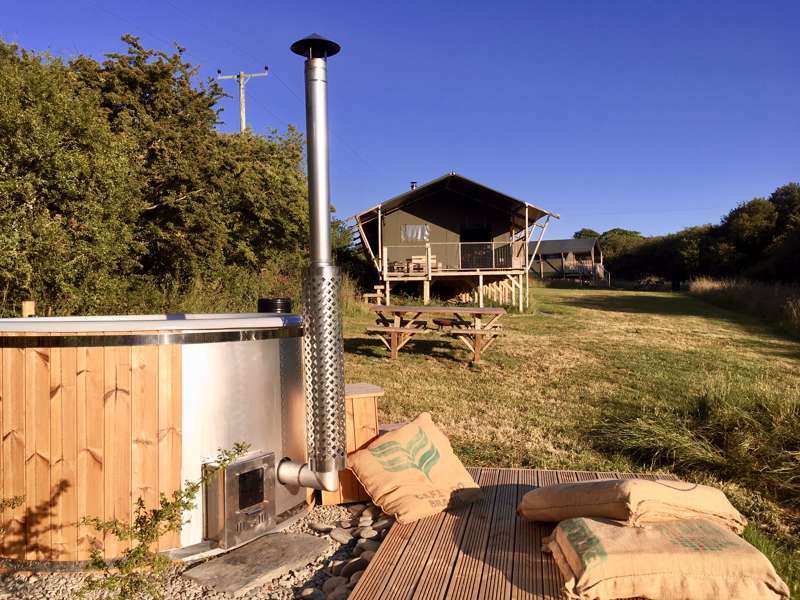 Cwtch Bach (meaning small snug/hug in Welsh) is suitable for couples or single occupancy. 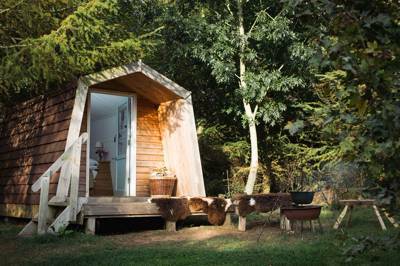 This bright and airy cabin benefits from the evening sun on the decking, which also floods in through the glass-paneled door. 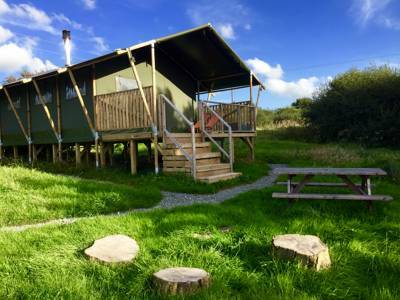 Cariad (meaning love in welsh) is popular with couples and comes with a double bed. 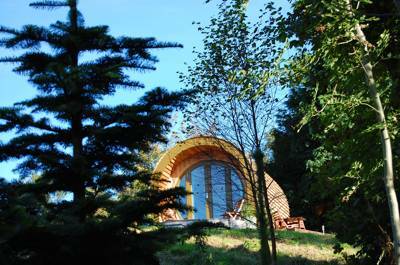 Cwtch Cariad is slightly set back in the woodland so it offers more privacy and benefits from the morning sun which floods in thought the large glass-paneled door into the bright interior. 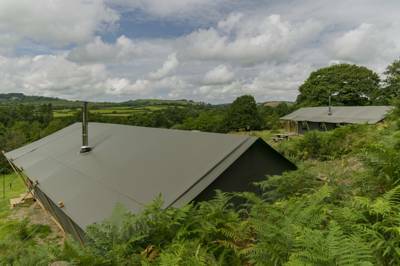 Ty Cwtch (meaning a snug in Welsh) is ideal for families with two double size beds (bunks) it can accommodate a family of four. 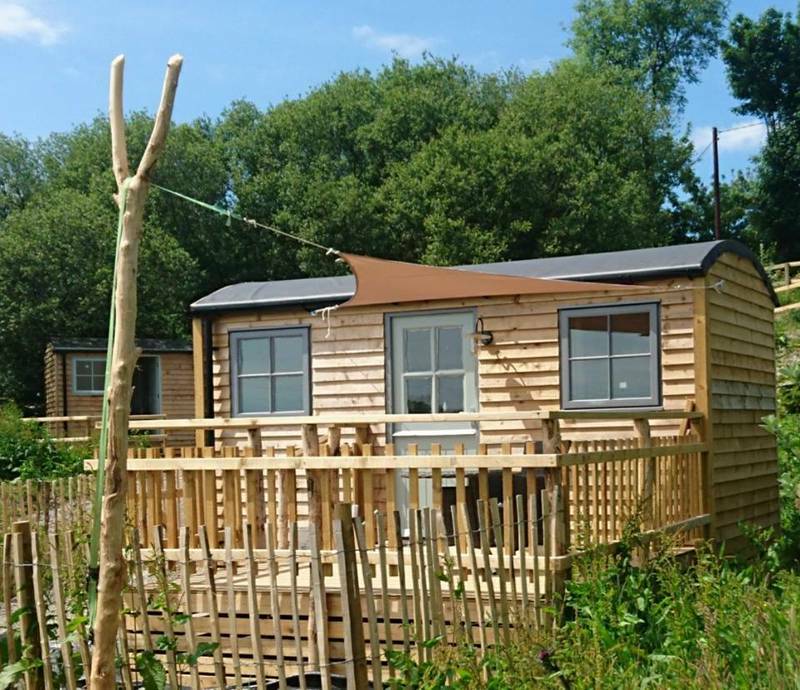 Ty Cwtch is just 10 metres from the communal kitchen cabin, 20 metres from the WC/Shower cabin. 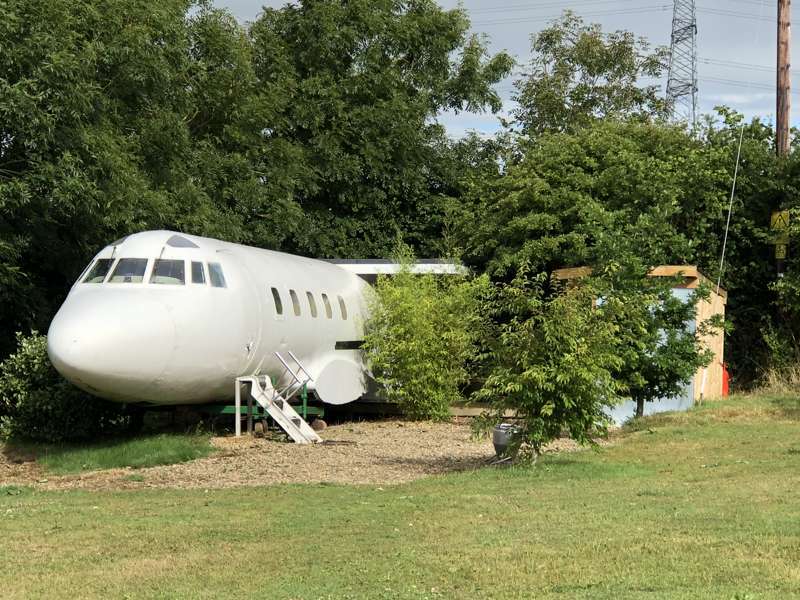 It comes with it's own private decking area. Under the canopy of the trees you will find your fire pit and picnic bench. 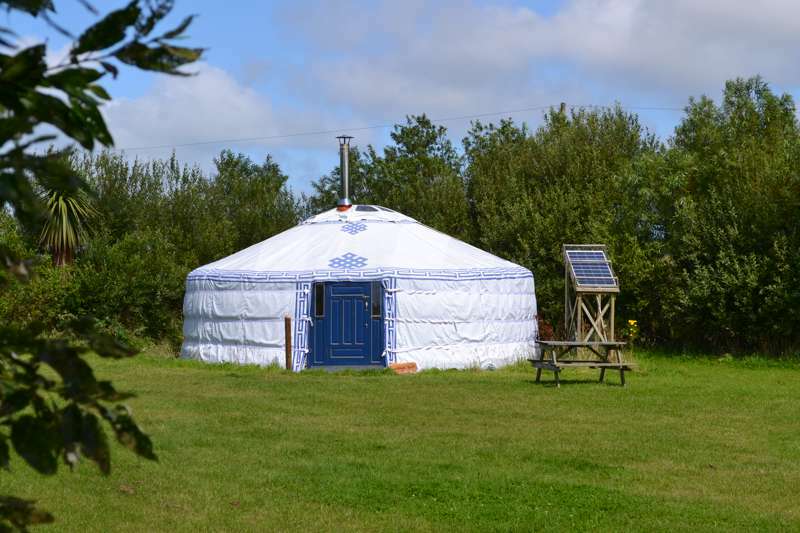 Large Mongolian yurt with solar lighting, contemporary furnishing and wood-burning stove. Spacious adjacent kitchen and indoor/outdoor shower. 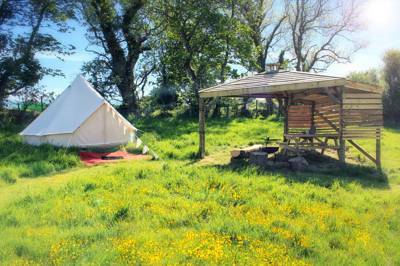 Hand crafted, cosy and beautiful - fully equipped with canvas out door kitchen. 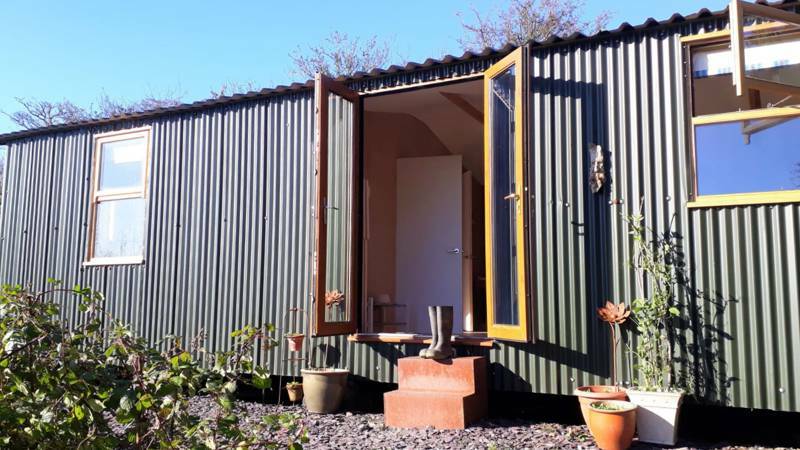 Shared use of on site facilities. 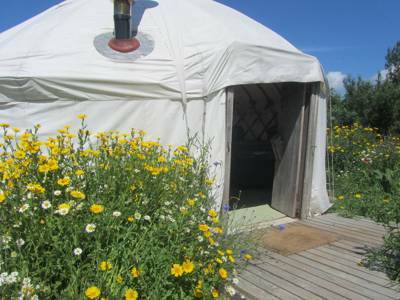 5 metre yurt, ensuite facilities, beautiful views in a sheltered, secluded spot, with private path through a butterfly meadow. 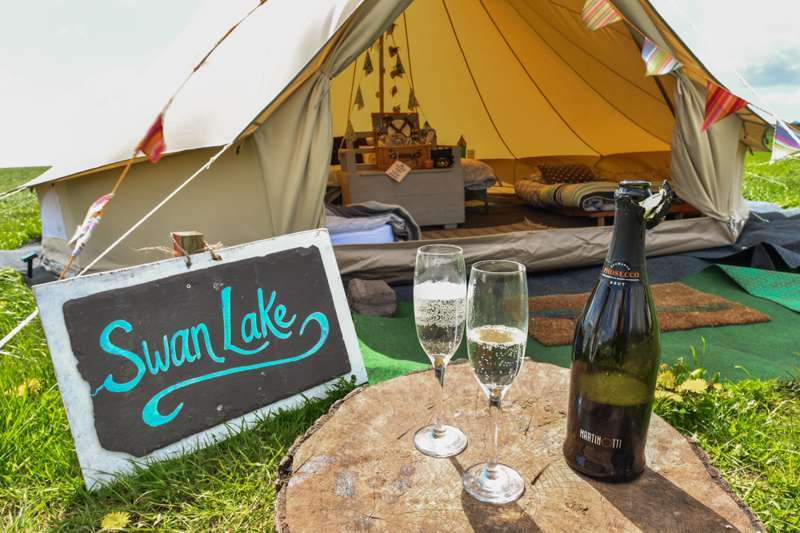 If camping is not for you 'The Glamavan' is the perfect solution. 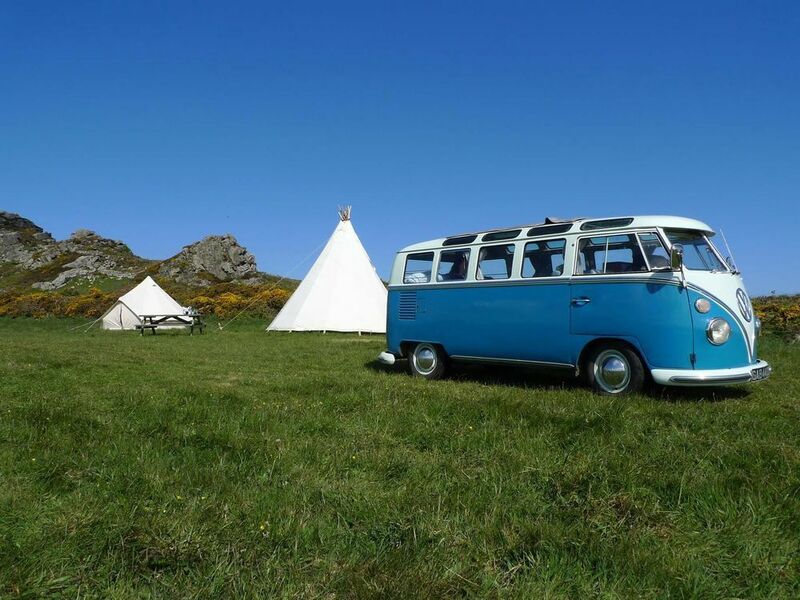 Experience the same benefits as the campers, but enjoy the luxury of your own home in a vintage-style retro-chic static caravan. 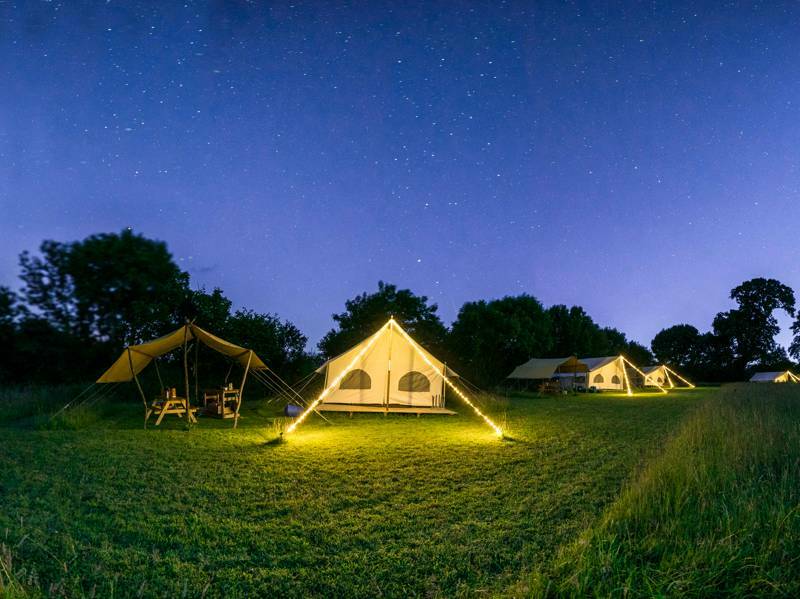 With crisp cotton sheets, and all the conveniences of a well-equipped home, this is deluxe camping. 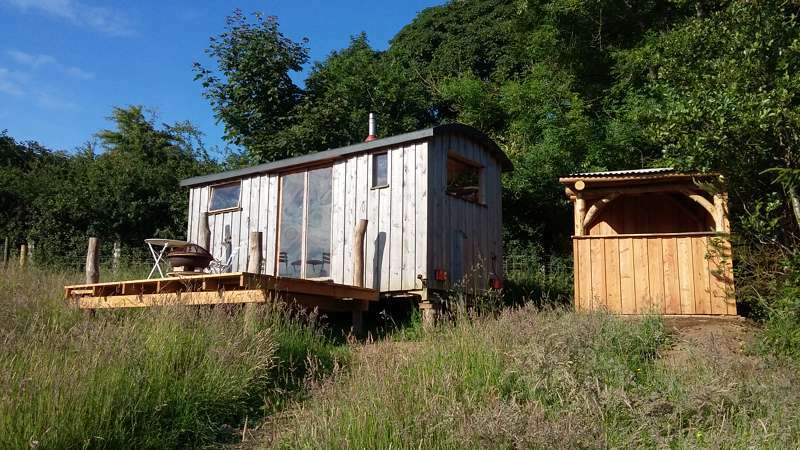 This beautiful shepherds hut is set in a peaceful, tranquil haven teeming with birds and woodland animals. 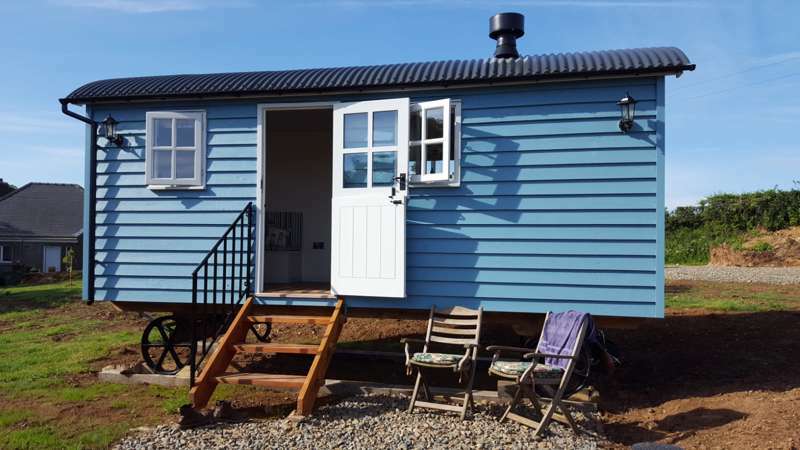 It has a built in double bed, wood burning stove and a fitted kitchen area complete with a beautiful copper sink. 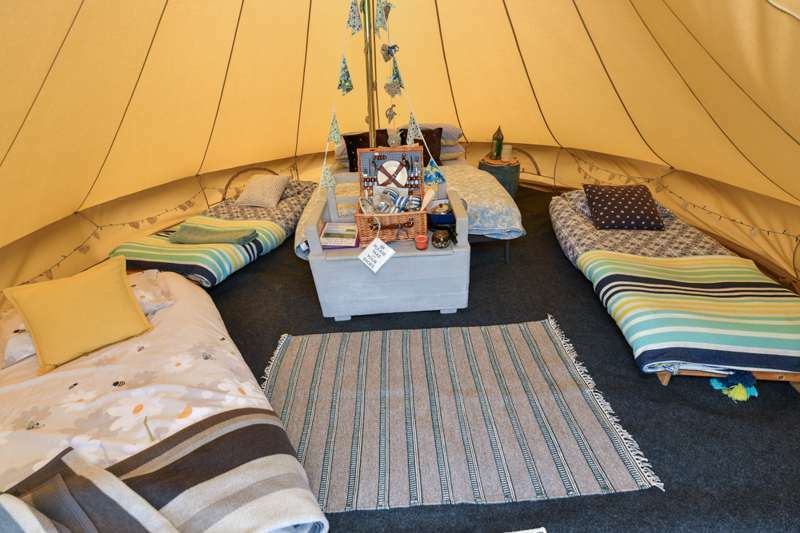 All bedding, towels and throws are provided, along with essential cooking utensils, crockery, pots and pans. 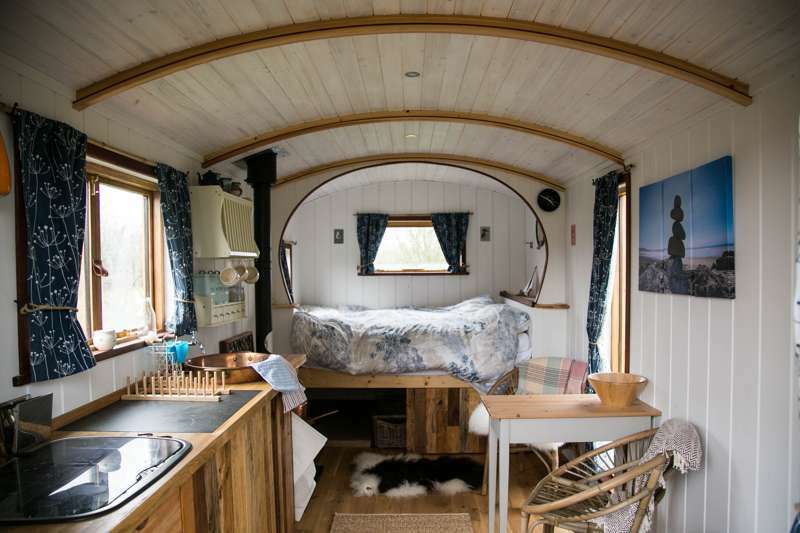 This floating home has a king sized double bedroom and living space with a fold-out sofa bed, plus a bathroom with a gas-powered shower,basin and toilet. 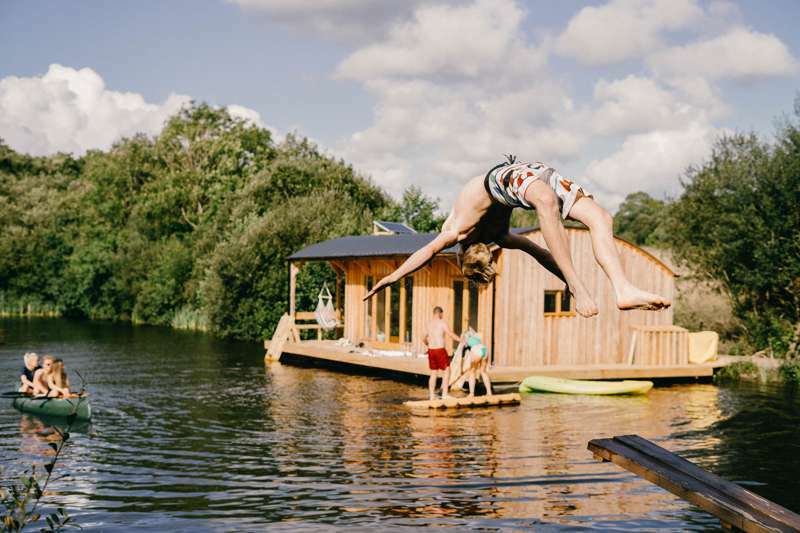 Have a dip in the lake and relax on your private decking area with seating and a barbecue. 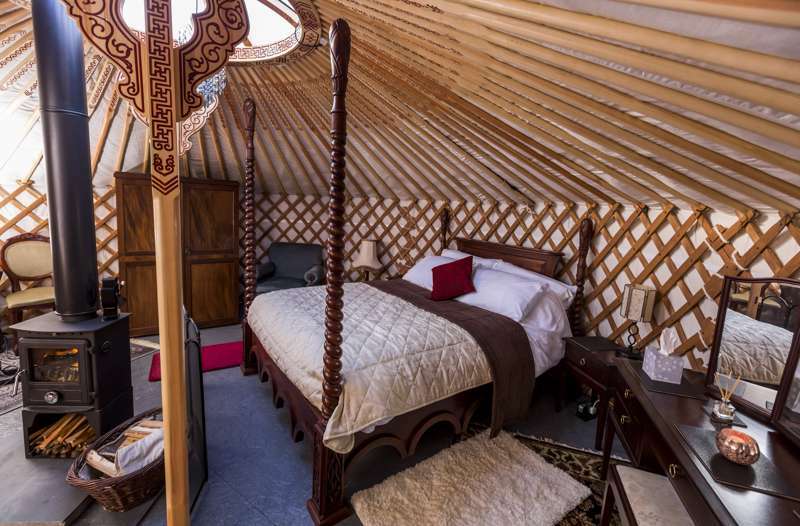 A spacious Mongolian-made yurt with a romantic four poster bed and wood-fired hot tub. 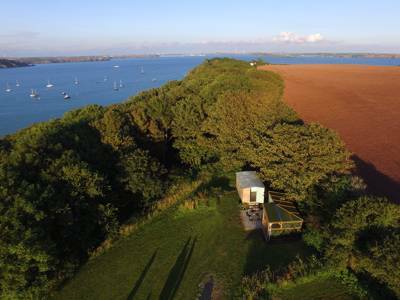 Private kitchen and shower room facilities, and all this around an elevated deck in a wildflower meadow. 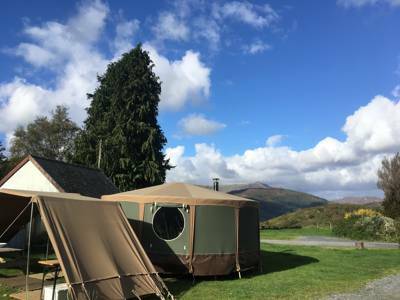 A glamping escape in wild Snowdonia for couples and families seeking adventure with creature comforts. Kitted out with a proper double bed with a thick mattress and two single sofa beds. 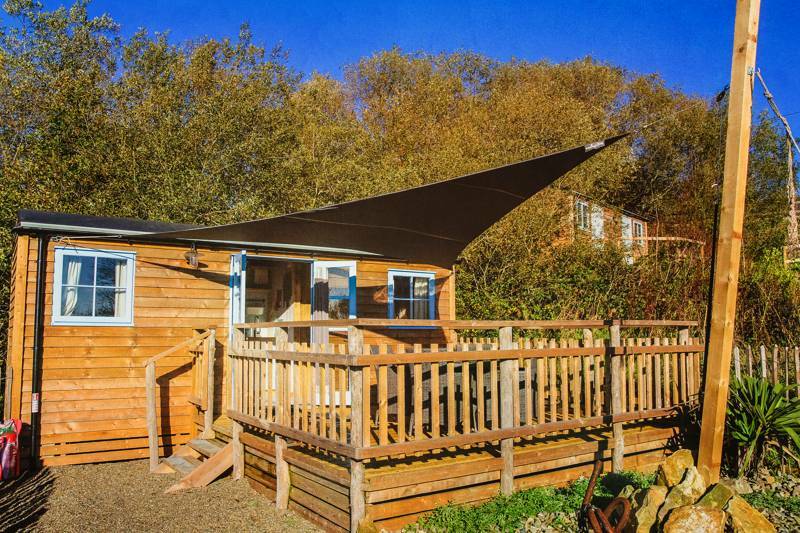 Finch sleeps up to 4 people, has an enclosed outside area with a fire pit and seating area. It also has decking with further seating/outside dining area. 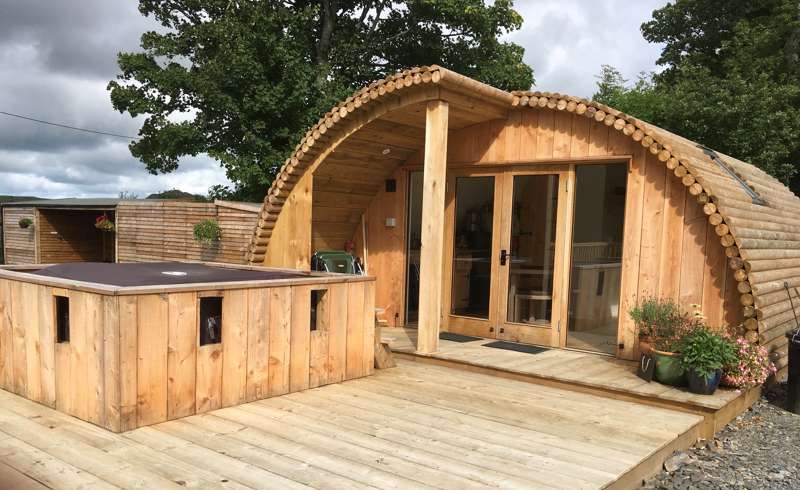 Wren sleeps 2 people, has an enclosed outside area with a wood fired hot tub, fire pit and seating area. 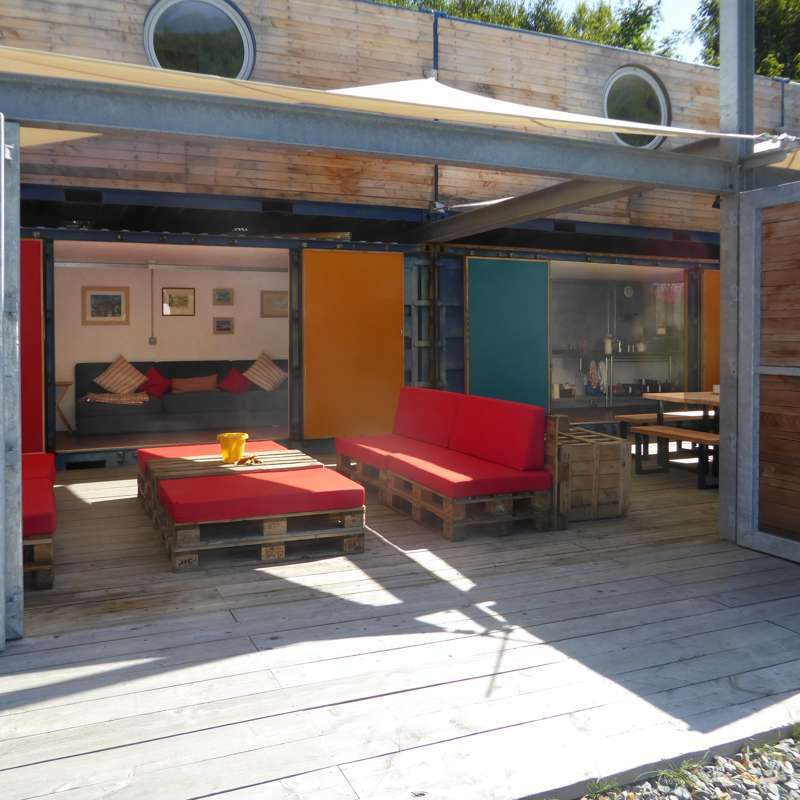 It also has decking with further seating/outside dining area. 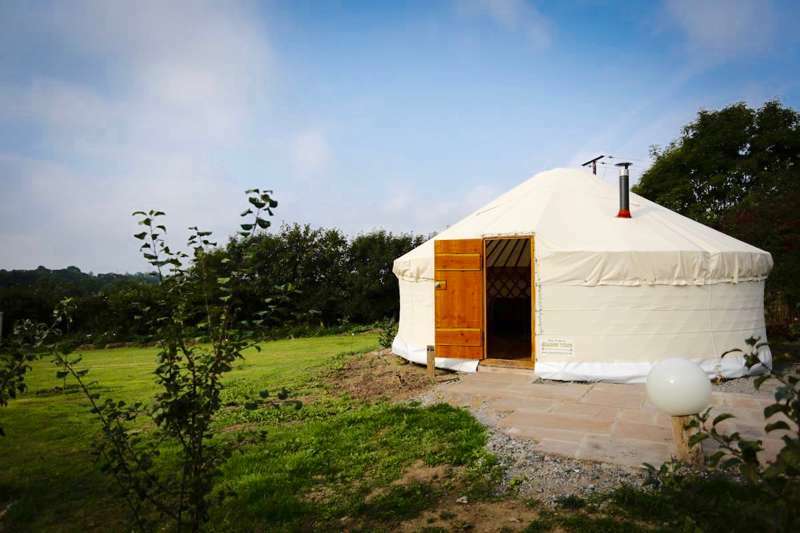 Cromen Ddôl is our largest, most spacious dome with a beautiful king-size, four poster bed & 2 singles. 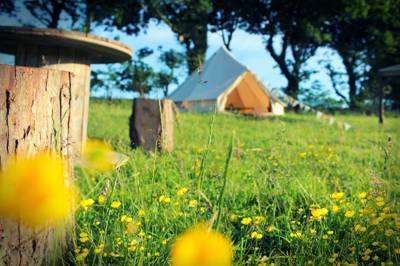 Ddôl is situated in a quieter area of our meadow & takes in the views of our beautiful Welsh countryside. To the front you can watch our chilled, furry neighbours, the Shetland ponies, mosey about & graze. 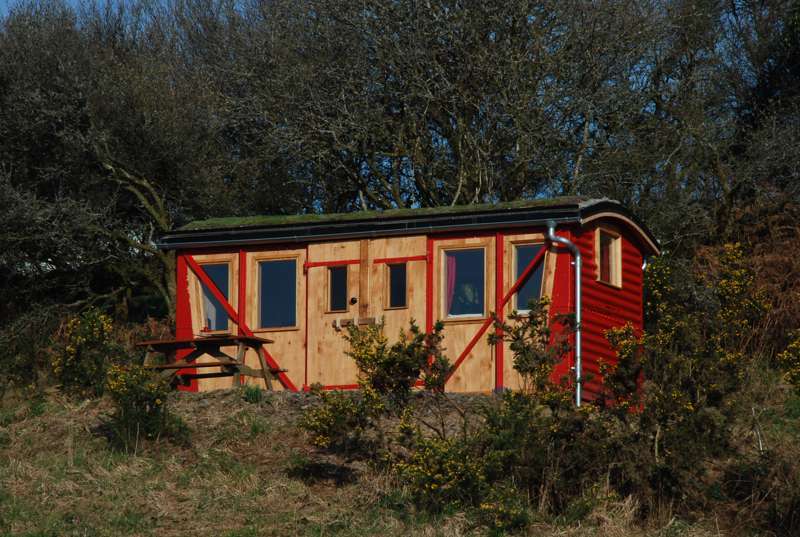 Cwt ar y Bryn is our airy, 4 person hut, with a king size bed & 2 singles (which can be made into a double). 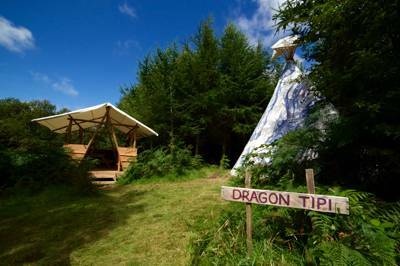 It is situated on the highest point of our land & has the most amazing views of pasture, trees, hills & mountains. 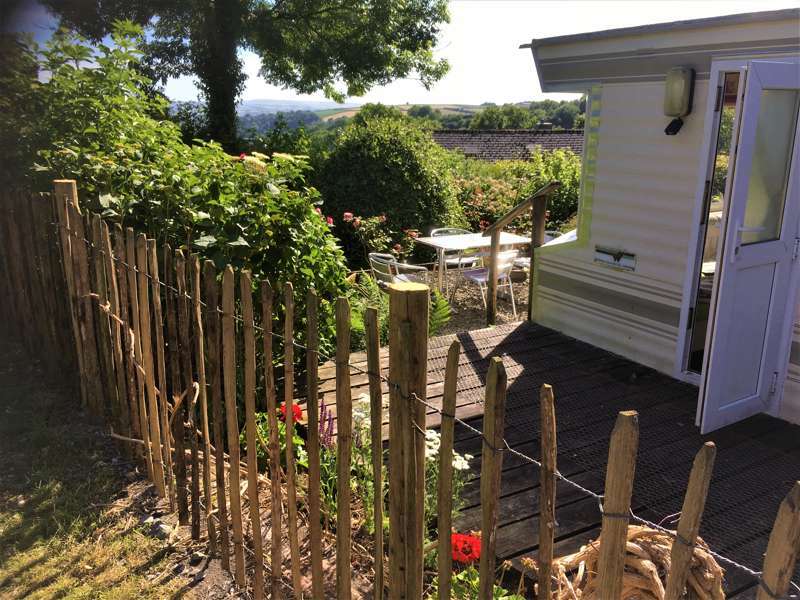 You get a slightly different view from each of our front windows, the French doors & private garden area. 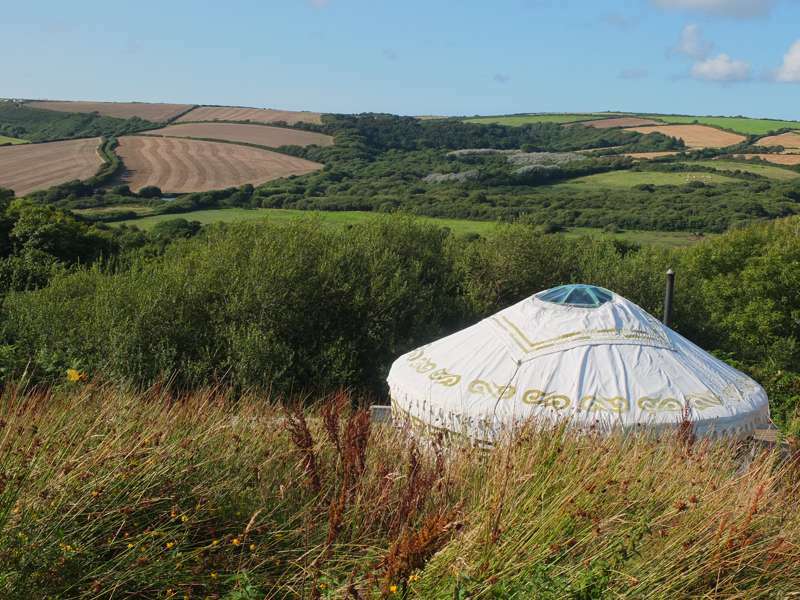 Cromen Glan Môr is our 4 person dome with a bespoke king-size, four poster bed & 2 singles. 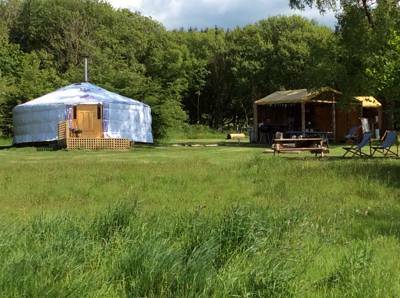 It's situated at the heart of our meadow, close to all facilities & has panoramic views of our wonderful Welsh countryside. The view is always tremendous but some mornings you can sit & watch the mist rise off the hills in the distance - utter relaxation. 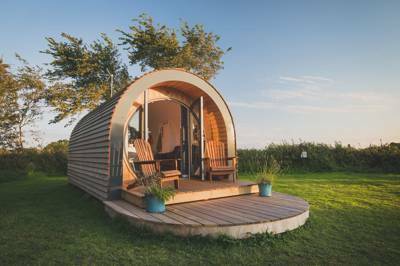 Y Cwt Cwtch (the cuddle hut) is a self contained, well appointed Shepherds Hut located near St Brides bay a mile from the Pembrokeshire coastal path at Penycwm. 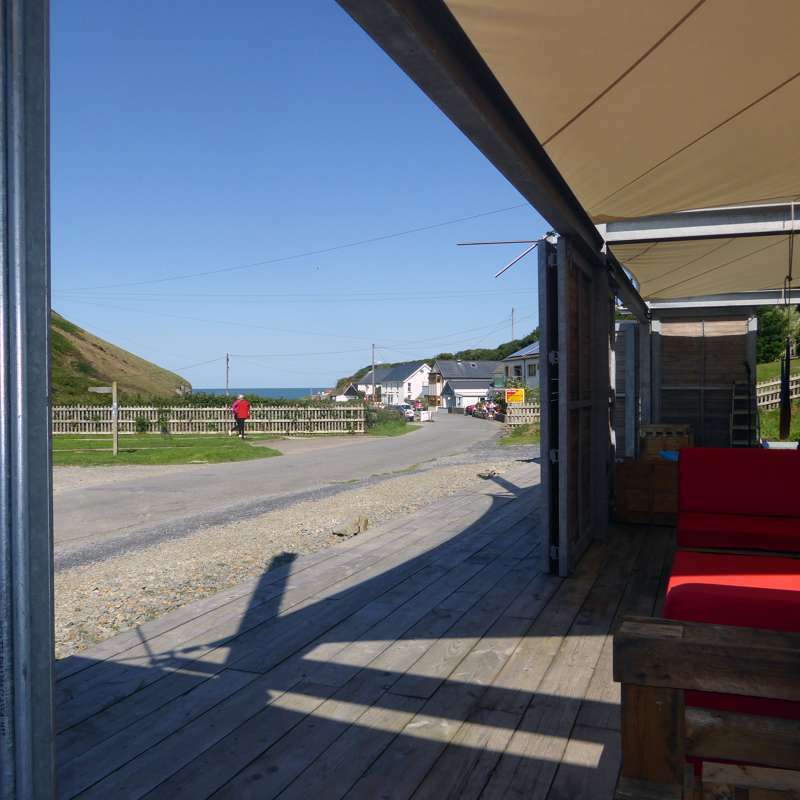 The harbour village of Solva is a couple of miles away and St David’s is approximately 15 minute drive. 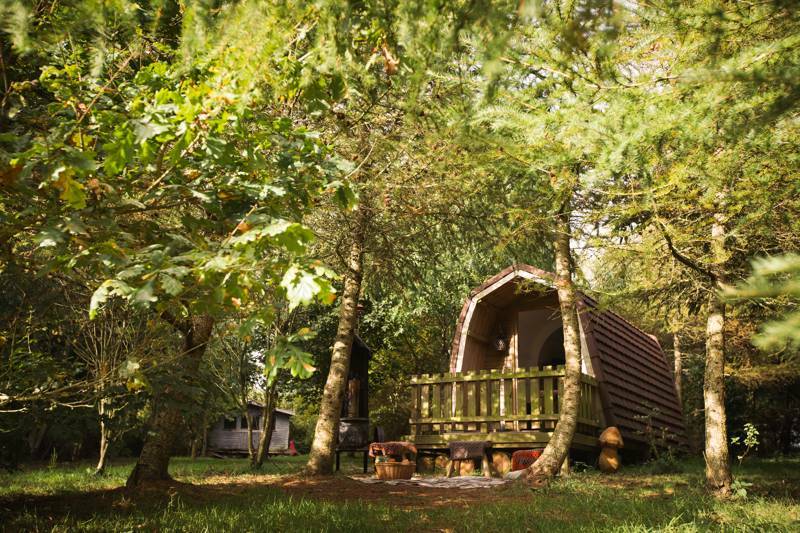 Y Cwt Cwtch has all you need for a cosy stay, with a log fire, kitchen and bathroom. 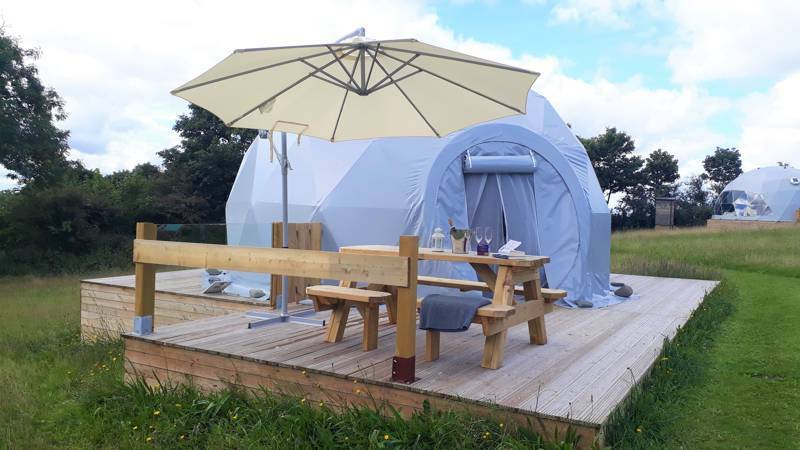 Glamping sites in West Wales, glampsites in west Wales at Glamping in West Wales, Glamping in West Wales: Browse West Wales glamping sites, read reviews and book your glamping holiday online for the best price.